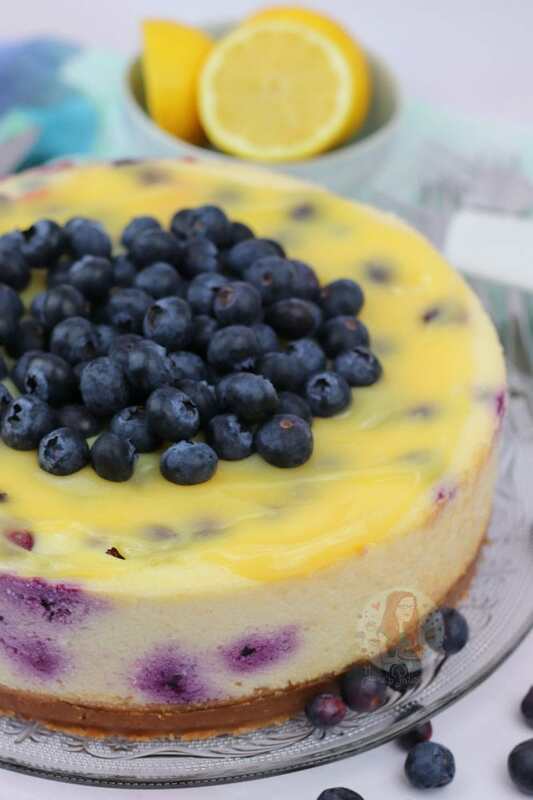 A Buttery Biscuit Base, with a Lemon Baked Creamy Cheesecake Filling full of Blueberries making a Dreamy Lemon Blueberry Cheesecake! Soooo, THIS HAPPENED. Oh my days, the dreamiest of dreams. 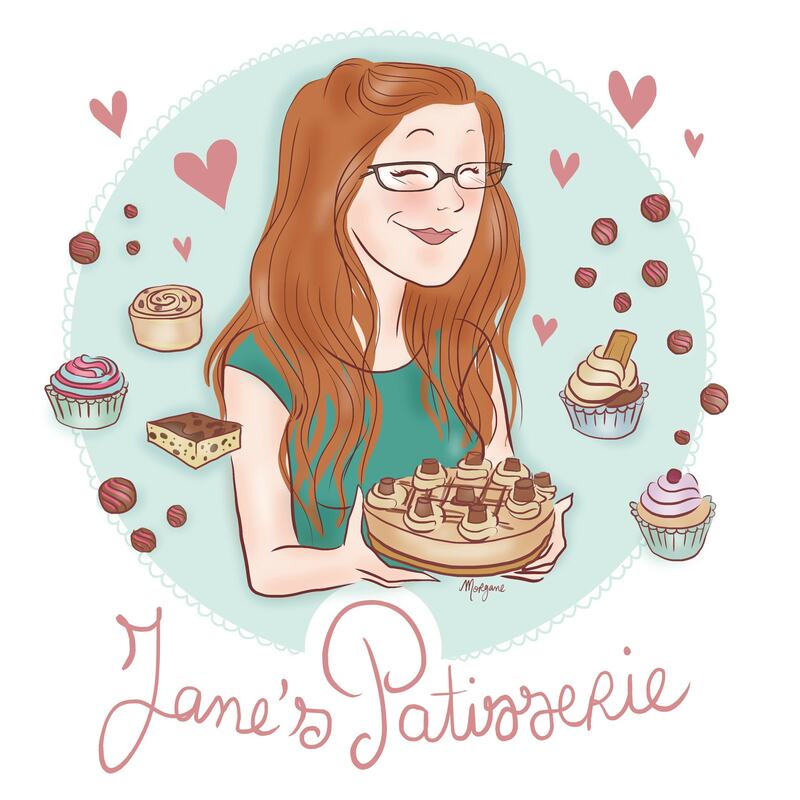 I will say from the start that its a baked cheesecake recipe… the shock and horror… as I’ve had a few requests for a few more baked ones, and I thought this one would be perfect for it. I will be posting a No-Bake version as well, so you don’t have to worry on that part! 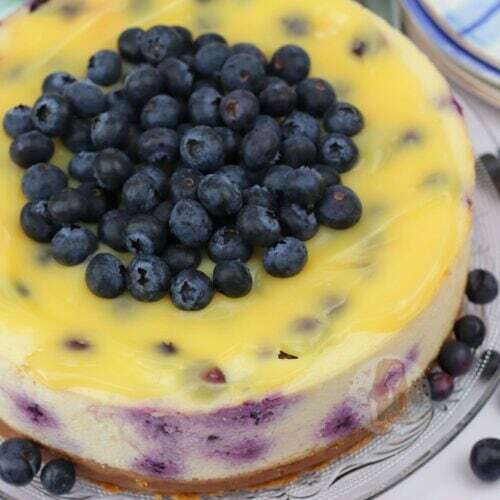 This Lemon Blueberry Cheesecake is just heaven in a bite. I went for a standard biscuit base for this, as I always do baked or not baked, and it worked wonderfully. They’re naturally softer when you bake them, so that’ll help those of you who struggle with the harder bases! And who doesn’t love a biscuit base?! 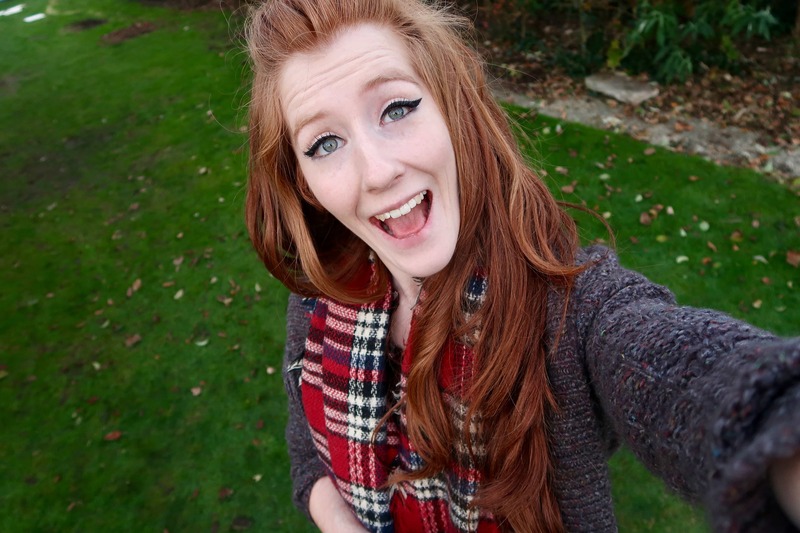 As you can see from the photos, it turned out perfectly. 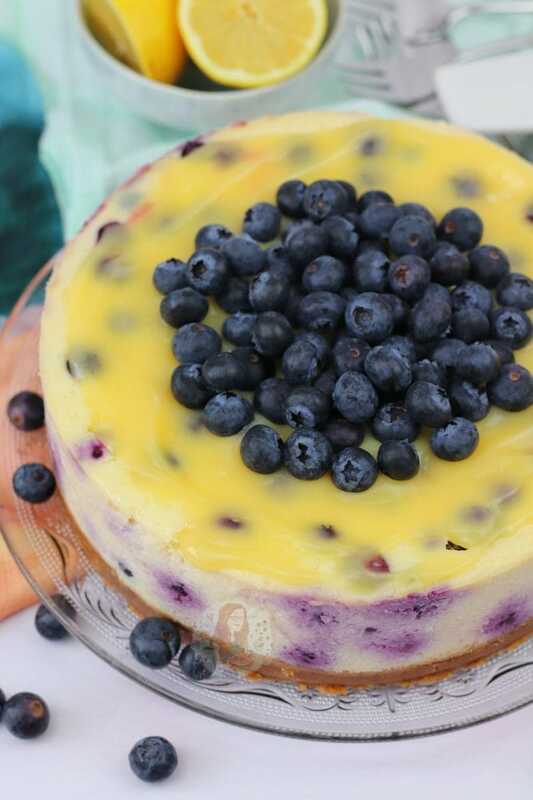 The dashes of the purple coming from the baked blueberries, and the creamy lemon cheesecake filling. The recipe is based on my New York Cheesecake as I just adore it as a baked cheesecake, but obviously made to be all delicious. I wanted to make a Lemon Blueberry Cheesecake since the success of my Lemon & Blueberry Cake, and I know you will all LOVE it. The good thing about a recipe such as this, is that if the cheesecake does end up cracking on the top (which is down to the mixing usually) you can cover it up with the Lemon Curd! 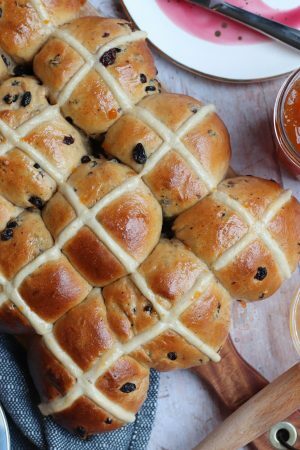 If you are careful when you mix it, bake it for the right amount of time, and cool it correctly it shouldn’t crack on the top… but it can. It doesn’t affect the taste at all if it cracks, but sometimes it just happens! 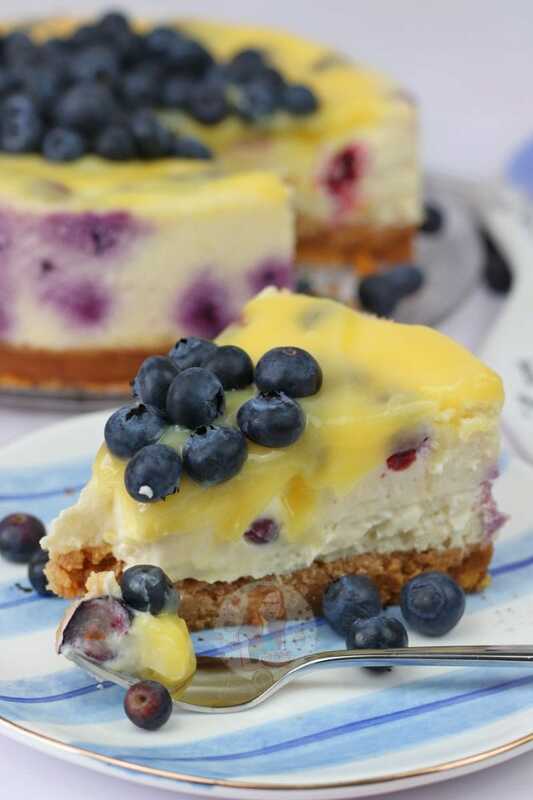 Luckily, the blueberries keep the cheesecake nice and moist, and its the dreamiest of flavour combinations. You can easily swap the blueberries to a different fruit, but this combination is my utter favourite. Raspberries are a great match with the lemon, as well as many other fruits.. but to be honest any berry type will work! You can also use less, but I love mine to be really fruity. 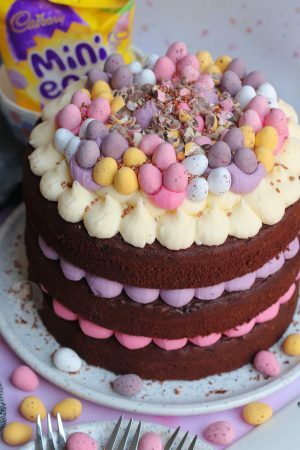 The flavours make me think of Spring, and Summer, and can make a nice change from all the chocolate ones I post! 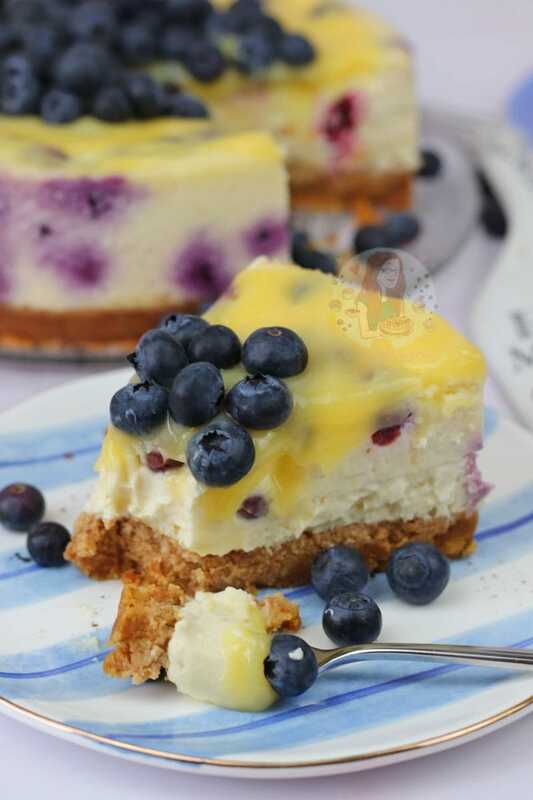 A Buttery Biscuit Base, with a Lemon & Blueberry Baked Creamy Cheesecake Filling! Preheat your oven to 220C/200C Fan and find your 8″/20cm Deep Springform Tin. Blitz your biscuits in a food processor until a fine crumb, pour in the melted butter and blitz again till combined. Press down firmly and refrigerate for now. In a stand mixer with the whisk attachment, mix the cream cheese for a couple of minutes till loose (on a slow speed) and then gradually add in the sugar and flour still on a slow speed. I weigh my sugar and flour into the same bowl and then spoon a bit in making sure each spoonful is incorporated fully before adding another! Fold through the soured cream/creme fraiche, and blueberries and pour into the tin carefully – bake in the oven for 10 minutes at 220C/200C Fan and then reduce the oven temperature to 110C/90C Fan and bake for a further 25-30 minutes. Leave the cheesecake to cool in the oven with the door slightly ajar for 2 hours. Once cooled, wrap the cheesecake (still in the tin) in foil and refrigerate overnight. Once chilled overnight, use a knife to run around the edges of the tin and carefully remove from the tin. 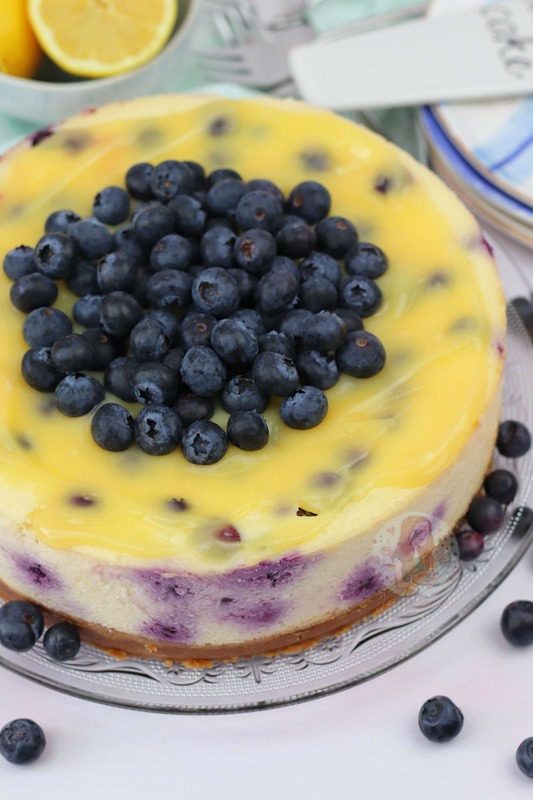 To decorate, I simply smothered the cheesecake in some Lemon Curd, and put on some more Blueberries! I always recommend using a 8″/20cm Deep Springform Tin in my cheesecake recipes as it fits the mixture perfectly! I really do recommend leaving this recipe wrapped in foil overnight in the fridge as it will produce the texture that you want and leave a really moussey and delicious cheesecake. You can leave the cheesecake to cool in the oven with the door closed if you want a slightly drier texture but I prefer it open! I really do recommend whisking this on a SLOW setting and being patient when you whisk it – if you don’t feel confident in this, its better to use a hand whisk then push it too far. Over whisking the ingredients can cause the mixture to split! You can use frozen berries in the mixture itself, but don't thaw them. Older Next post: Hot Chocolate ‘The Works’! 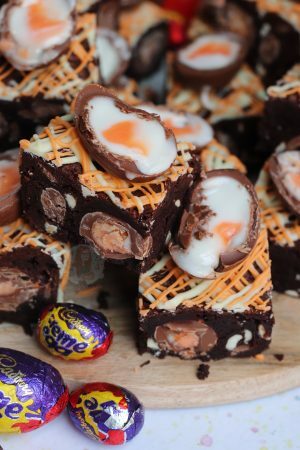 Newer Previous post: Kinder Bueno Brownies! I’ve made a few of your recipes. 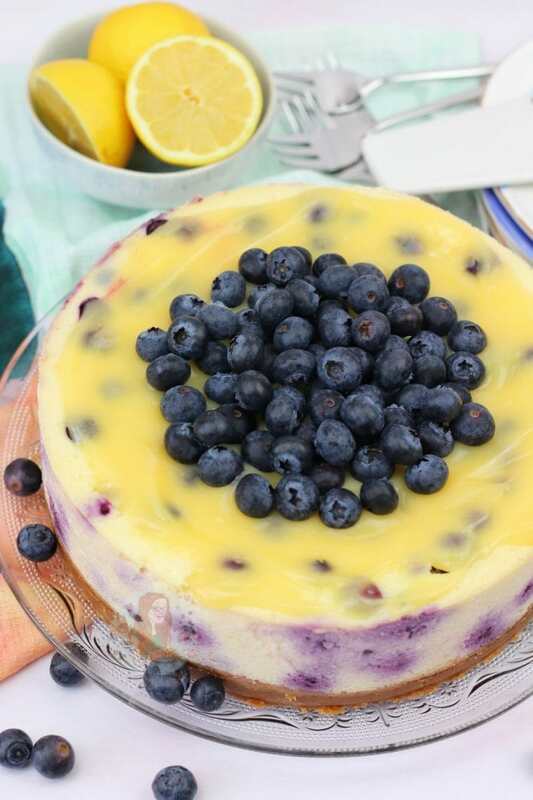 Most recently this lemon and blueberry cheesecake and it turned out perfectly. Looked just like yours and everyone enjoyed it. Have you tried lemon and raspberry. Do you think that would work and could you use fresh raspberries or would frozen be best. Hey! Ah thats amazing! I’ve done it with fresh raspberries and it was yum! Does the tin need to be lined or greased before pouring the mixture in? Or will it come away from the sides ok during baking? What exactly is a “digestive”? I can convert measurements but this has me puzzled.